Chotha 0.1 just released. You can download it from here. 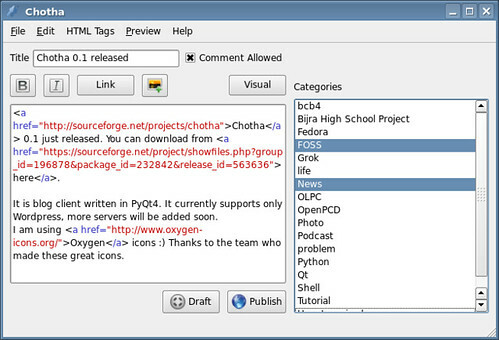 It is blog client written in PyQt4. It currently supports only Wordpress, more servers will be added soon. I am using Oxygen icons :) Thanks to the team who made these great icons. UPDATE: Please download the new source for chotha. I did a major mistake and uploaded wrong file, fixed now.